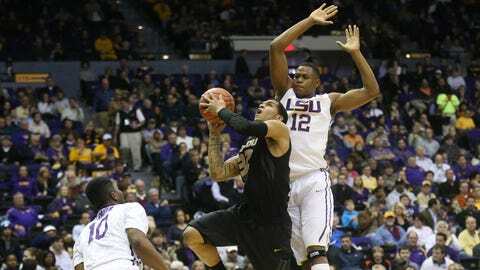 Jabari Brown's career-high 28 points weren't enough for Mizzou to pull off a victory at LSU. BATON ROUGE, La. — Anthony Hickey made four consecutive free throws in the final minute and LSU held on for a 77-71 victory against Missouri on Tuesday. Hickey, who entered the game shooting 50 percent from the free-throw line, was fouled on purpose twice by Missouri. Hickey made his first pair of free throws to give LSU (12-5, 3-2 Southeastern Conference) a 74-68 lead with 37 seconds remaining. Following a 3-pointer by Jabari Brown, Hickey was again fouled. Hickey sank two more free throws with 17 seconds left to push LSU ahead 76-71. Shavon Coleman led LSU (12-5, 3-2) with a season-high 19 points. Johnny O’Bryant added 16 points, while Andre Stringer had 12. Jordan Mickey scored 14 points and grabbed 13 rebounds. Brown had a career-high 28 points for Missouri (14-4, 2-3). Jordan Clarkson contributed 19 points, while Earnest Ross had 16. Missouri, which trailed for most of the game, went ahead 65-64 on a 3-pointer by Brown with 3:39 remaining. LSU’s Mickey replied with two free throws and a field goal and Coleman made a layup after a steal by Tim Quarterman. Missouri stayed in striking range as Clarkson made three of four free throws on Missouri’s next two possessions. Then Hickey was fouled twice, and he sealed the win with his clutch foul shooting.